Annual price growth in prime central London fell to 2.8% in April, the lowest rate since November 2009. Growth has been on a downwards trajectory in recent months ahead of the general election, but the Conservative Party victory suggests April is likely to mark the low-point in the cycle. The principal effect on the prime London property market is that it removes the prospect of a mansion tax on properties worth more than £2 million. As we discuss in our post-election analysis on page 5, this will lift transaction levels but the extent of any short-term boost to prices is less clear-cut. It will also be significant to note to what degree the opposition Labour Party moderates its policies around wealth creation and taxation and whether this reduces the rhetoric of the wider economic debate. 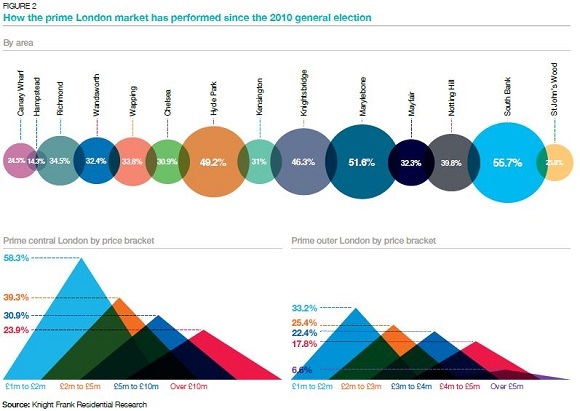 The chart below shows how prices in prime central and prime outer London have performed between the last two elections. The safe haven appeal of prime central London was evident during 2011 as fears over the future of the euro zone mounted. The crossover in 2013 happened as the UK economic recovery took hold, boosting price growth beyond prime central London and paving the way for the Conservative election victory. However, price growth in both areas has slowed notably since last summer as the election approached. Today, as the map on pages 2 and 3 shows, the strongest price growth has been in newer prime markets north of Hyde Park and east of Mayfair, due to the lower concentration of high-value properties and as buyers seek more value away from established markets. However, it has not been a clear-cut picture, which suggests any recovery will not be uniform. At the sub-£2 million level, the impact of the election was minimal in Islington while activity dipped in Canary Wharf, due to its links with the financial services sector and position as a first-home market, suggesting a higher level of pent-up demand. In higher price brackets, a general mood of pre-election reticence was tempered by strong demand for high-quality new-build properties as well as the continued flow of safe haven money into London as geopolitical risks shifted around the world. Following the Conservative Party general election victory, several short-term outcomes are likely in the prime London residential market. First, numerous transactions put on hold pending the outcome of the vote will proceed as the risk of further property taxation appears less of an immediate threat. Other sales will progress simply because the election is over and a deeper sense of political uncertainty has receded. As the logjam unblocks, it is likely to be accompanied by a hardening of expectations on the part of vendors over asking prices and some will expect prices to immediately rise as a direct consequence of the election result. In the short-term, the impact on pricing is likely to be less marked than some expect. The first reason is the quantity of properties coming onto the market. Many vendors lined up sales for Monday 11 May, irrespective of the outcome of the election. The second reason is that this short-term increase in supply is likely to exceed any uptick in demand. Activity in the prime London market has dampened in recent months as buyers and sellers factor in political risks but also as they digest measures like the stamp duty increase. The market is in the final stages of absorbing these changes, meaning some buyers will still proceed with care. Furthermore, some prospective buyers will have signed rental contracts as they hedged their bets on the outcome of the election, meaning they are unable to act for several months. It indicates a short delay before a supply / demand equilibrium returns and a likely ‘expectation gap’ between asking prices and the prices that new and newly-active buyers are prepared to pay. However, price growth is likely to return more quickly in markets that have underperformed the prime central London average, including areas in Kensington & Chelsea where there has been low single digit annual growth in recent years. Additionally, areas with low stock levels where a series of high-quality properties comes onto the market, are likely to see price growth outperform the average in a prime London market where demand is increasingly product rather than postcodedriven. Despite the election result, it would be wrong to believe there will be no further political measures that may impact the market. The Conservative Party may tighten up the rules surrounding non-dom status or review the current council tax bands. 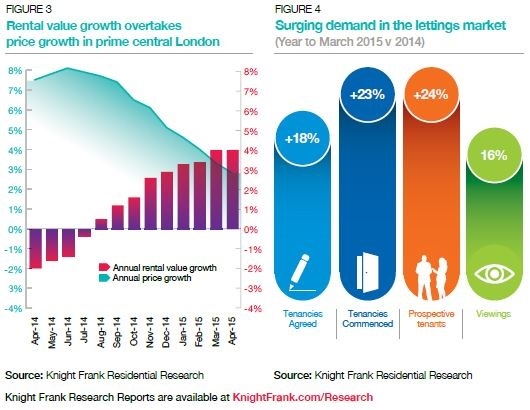 Knight Frank forecasts negligible growth in 2015 in prime central London and 3% in prime outer London, a prediction that will be reassessed in due course. The impact of the general election result on the lettings market in prime London will be more subtle and deferred than the effect on the sales market. Over the past year, the lettings market has benefitted from uncertainty surrounding the outcome of the general election as some buyers opted to rent and a number of vendors became landlords to hedge against the possibility of further property taxation. 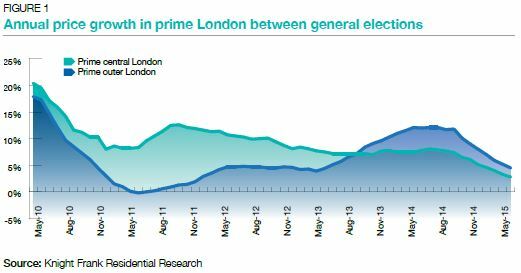 As a result of this switch and the recovering UK economy, annual rental value growth in prime central London exceeded price growth in April, which has not been the case for almost four years, as figure 3 shows. Growth of 4.1% is the highest it has been in more than three years. The strength of the market was reflected in the fact the number of tenancies agreed in prime London in the year to April rose 17.9% while the number started increased by 23.2%. Meanwhile, the number of viewings and new prospective tenants rose 16.1% and 24.1%, respectively, as figure 4 shows. Though some landlords may revert back to the sales market as the threat of property taxation recedes, the scope for knee-jerk action is limited by the fact there is unlikely to lead a short-term spike in prices, for the reasons explained on page 5. However, the election result is likely to boost the fortunes of companies, which would benefit the prime London lettings market as businesses expand and increase accommodation and relocation budgets. The positive reaction from the business sector to the Conservative Party victory was underlined by the fact more than £50 billion was added to the value of companies listed on the London Stock Exchange the day after the election. The result means a proposal for rent controls has disappeared but costs are likely to rise under new rules that will lead to increased immigration checks on tenants and occupiers. New regulations also mean it will also become easier for tenants to sub-let. In other ways, the effect on the lettings market will be psychological as much as financial. A boost in activity is likely for the simple reason the election is over rather than due to a specific outcome. Other local factors are more significant than the election. For example, the oil price slide has seen demand dip from oil company executives who have traditionally been active in Wimbledon. Gross rental yields in prime central London held at 2.92% in April, the result of a modest rise in sales values, largely driven by price growth in areas including Islington, Hyde Park and the City. Gross rental yields in prime outer London were largely unchanged at 3.49%, close to their 12-month average. This report is published for general information only and not to be relied upon in any way. Although high standards have been used in the preparation of the information, analysis, views and projections presented in this report, no responsibility or liability whatsoever can be accepted by Knight Frank LLP for any loss or damage resultant from any use of, reliance on or reference to the contents of this document. As a general report, this material does not necessarily represent the view of Knight Frank LLP in relation to particular properties or projects. Reproduction of this report in whole or in part is not allowed without prior written approval of Knight Frank LLP to the form and content within which it appears. Knight Frank LLP is a limited liability partnership registered in England with registered number OC305934. Our registered office is 55 Baker Street, London, W1U 8AN, where you may look at a list of members’ names.